Allan comes from a Buchan crofting and farming family and will delight readers with his charity fund-raising collection of poems and stories based in and around the Peterhead area. 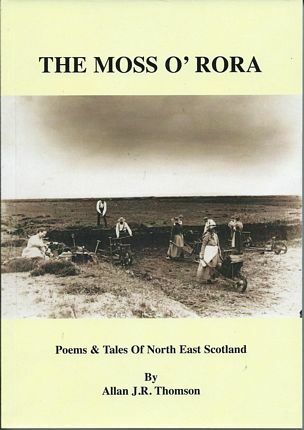 The Moss o' Rora is five miles of land around farms and crofts and Allan opens with a brief history of the folk who worked these lands almost two hundred years ago and gives a fascinating insight into their lives. Stories to look out for include a history of the folk who lived and worked at Mosside Croft in Hatton, the Bogie Rolls tobacco smoked in pipes by agricultural workers and the secrets of Grunny Sangster from Berrylea Croft. My favourite is the naughty deed done by the author when he was a Police Officer at the door of Number 10 Downing Street! Proceeds from The Moss o Rora Book are donated to Ninewells Hospital Cancer Campaign through the Kirriemuir Rotary Club, of which Allan is a member. It is so easy to see why Allan has already raised over £9000 as this is the best Doric book I have read this year. 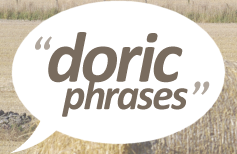 Readers benefit from a glossary of over 800 Doric words, some of which I hadn't heard of, and Allan has kindly contributed many to our A-Z Doric Words Database.